Rockland Web Design Blog: Social Media's ROI: CHANGE. For the last 5 years, I've heard the question "Where's the ROI" used in conjunction with Social Media more often than "Where's the Beef" back in the 1980's. The problem is that most people try to take platforms like Facebook, Twitter, YouTube and LinkedIn, and use them for some sort of direct Business or Financial gain. But as you've probably seen over the years, that rarely works. I remember about 5 years ago I was talking with a trusted mentor of mine in the web development community, and I told him that Facebook was going to be a very important platform, and we should develop and integrate our websites in conjunction with it. He responded that he just doesn't see the value of Facebook and other Social Media, and it would be pointless to change anything we are doing, or try to develop any sort of interface that would be useful for our customer base at that time. In a rare divergence of opinion with him, I decided to use the platform to try and better connect with my community - obviously there was a business purpose, but I endeavored to do it in a more authentic, upfront manner than just putting up a post and expecting the world to respond to it. To this day, when I log on, I try more to see what others are doing rather than focus on posting my own things. This week we've again seen just how effective Social Media can be as a communication tool. 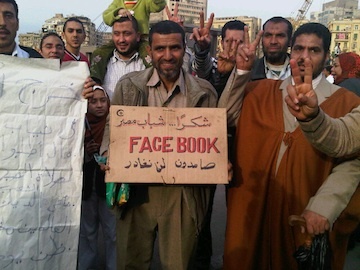 As a result of Facebook and Twitter, Egypt's Hosni Mubarek was removed from power. What happens next is anybody's guess, and hopefully the transition will be as peaceful as can be. But the point has been made, that when people organize around any cause that is near and dear to their hearts, significant change can be the result. 1. If you are not listening to the voice of the people whom you serve, you and your business can become obsolete in short amount of time. Think about it...did we even consider Egypt just a few short weeks ago? Yet on Facebook, Twitter, YouTube etc., people were organizing and discussing issues, and came to the collective conclusion that it was time to change the system. 2. Even people with limited resources are able to connect, organize and ignite change using Facebook. Thus it makes more sense than ever to always keep these powerful voice in mind as you are growing your business. 3. On the Internet, money does not equal power. The will of the people equals power. Thus, you cannot directly attribute ROI to every online endeavor, rather steer your business in the direction of what best serves your audience. I often talk about the reverse 80/20 rule, in which 80 percent of your time on Social Media should be spent listening, serving and conversing with others on random things that build connections with your friends and audience. The other 20 percent of the time is used on the ROI-building activities, such as discussing new services, advertising events, and other endeavors that are profitable. While the 80 percent may not bring direct results, it does wonders for you and your business in terms of reputation. You may not ever have to deal with a revolution as monumental as that of Egypt, but you can certainly be a part of the community that creates positive change. To do this, consider embracing some of the ideas mentioned above. It will change your business, and more importantly...it will change you - in my opinion, for the better. Nice post. It's very funny to me how businesses still don't see the rewards in social media. For the most part I think it is because they don't want to be bothered with another thing to do, or think it's something for teens, but in reality it has tremendous potential to do so many things. Great point about Egypt, one of the biggest results of this new social/digital age. We all need to realize that these services are real, and help make actual differences in the world. This is the new communication that everyone should get to know a little about.